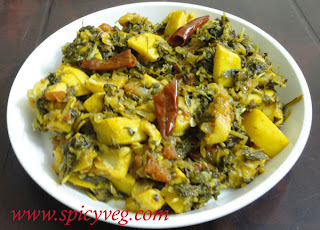 Fenugreek and Guavas a unique combination.Variety twist for the regular Aloo methi.Tangyness of the guavas gives this dish a unique flavour.Perfect dish for the ones who are looking for a low calorie diet. Fenugreek Leaves (Methi)-1 big bunch - chopped finely. 1.Boil 4 cups water with 2 tsp salt in a kadai.Add fenugreek leaves and boil for 5-6 minutes on low heat till soft.Drain,refresh in cold water and keep aside. 2.Cut guavas into 4 pieces.remove the seeds and cut into 1inch pieces and set aside. 3.Heat oil in a non-stick pan or kadai.Add cumin,broken red chillies and chopped ginger.Stir and add the onions.Cook till light brown.Add coriander powder,turmeric,salt and garam masala.Stir for a minute. 4.Add the tomato and cook for 3-4 minutes on low heat.Add guava pieces.Stir for 2 minutes.Add 1/2cup water,cover and simmer the masala on low heat for 5-8 minutes,till it is well blend and guavas are cooked. 5.Add Boiled fenugreek leaves and 1/4 tsp salt.Stir fry the for 5-6 minutes.Serve hot with roti or rice.